California collision repairers can breathe a little easier. 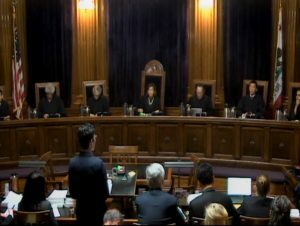 The state Supreme Court has reversed a lower court ruling and supported the California Department of Insurance’s ability to develop new regulations to address bad insurer behavior, even measures not specifically called for by state statute. No, the court ruled Monday. The outcome was important because Jones seems to be doing some of the same things with his body shop regulations. The “prevailing rate” measure sets out a standard that any insurer who conducts a labor rate survey could follow to receive a”rebuttable presumption” they were acting in good faith on labor rates. The steering regulation adds extra clarity as to how insurers should refrain from using misleading statements to direct customers to direct repair program shops. Decision in Association of California Insurance Companies et al v. Jones, etc.